In January 2017, a record group of 51 UMBC researchers from 13 academic departments and research centers submitted a proposal to the MRI program of the National Science Foundation to ensure the future of HPCF. We have now received an award of $550,000 towards new equipment for HPCF. To put this success in perspective, one just has to recall that in 2008 we received $200,000 and in 2012 $300,000. With UMBC’s mandatory cost-share of 30% of the total purchase, we have very significant resources available to ensure the availability of an up-to-date computational resource for the UMBC community. Since the original PI Dr. Matthias Gobbert (Mathematics and Statistics) joined the National Science Foundation as rotator in September 2017, Dr. Meilin Yu (Mechanical Engineering) took over the responsibility of the grant’s PI. UMBC News published a story about this achievement here. An interdisciplinary group led by Dr. Jianwu Wang (Information Systems), with Dr. Matthias K. Gobbert (Mathematics and Statistics), Dr. Zhibo Zhang (Atmospheric Physics), and Dr. Aryya Gangopadhyay (Information Systems) was awarded a $500,000 grant under the new CyberTraining initiative of the National Science Foundation. This online training consists of instruction in the areas of data, computing, and atmospheric sciences. Participating graduate students, post-docs, and junior faculty from around the nation will be exposed to multidisciplinary research experiences and have the opportunity for significant career growth. See cybertraining.umbc.edu for complete documentation and how to apply for Spring 2018, when the training will be held face-to-face for one semester only. UMBC News published a story about this award here, as well as the U.S. Senators of Maryland made announcement here. HPCF is hosting a Two Day Summer Short Course on Iterative Linear Solvers. In many application areas of science and engineering, the linear systems that need to be solved are both large and sparse. Iterative linear solvers are the appropriate methods for these systems and their understanding vitally important. The presenter, Prof. Dr. Andreas Meister is an internationally renowned researcher in Numerical Methods. For all details and to register (free), please visit the event page. UMBC has this opportunity for a free workshop, since Prof. Dr. Meister is visiting us in the framework of the university partnership with the University of Kassel in Germany. He spent a sabbatical at UMBC, during which he taught classes in the Department of Mathematics and Statistics. Point of contact for this initiative is Dr. Matthias Gobbert. Congratulations to Jonathan Graf and Qing Ji for being honored as CIRC consultants of the year for 2016! The Center for Interdisciplinary Research and Consulting (CIRC) is a key partner with the HPCF and provides mathematical and statistical consulting to the UMBC community and beyond. Pictured from left to right: Rouben Rostamian, Chairman Department of Mathematics &amp; Statistics, Qing Ji, Jonathan Graf, and Nagaraj Neerchal, CIRC Director. The VP for Research Karl Steiner in collaboration with VP for IT Jack Suess organized the Research Forum on High-Performance Computing, for more information see the HPC Research Forum myumbc event page. The UMBC HPCF user community will host a second user community meeting on Friday April 10th at 3:30pm in MP 106. This meeting will focus on answering user questions with a detailed discussion of how to interact with the slurm scheduler. Users are encouraged to bring questions to the meeting. The maya cluster will observe a dowtime for patches on Tuesday April 7th, 2015 at 5:00pm. All jobs should be stopped and users logged off at this time. The UMBC HPCF user community gathered for a full user meeting on Friday March 27th at 2:30pm in MP 106. 32 users attended the meeting from 15 research groups. The Linux Users Group on UMBC’s campus will host a Slurm presentation in their meeting at 12:00pm in ITE room 234. For more information on the group see their website: UMBC Linux Users’ Group. The projects of Teams 4 and 5 of the 2014 REU Site: Interdisciplinary Program in High Performance Computing were presented in the minisymposium “Parallel Computing for Partial Differential Equations on CPUs, GPUs, and Intel Phi” at the 2015 SIAM Meeting on Computational Science & Engineering (CSE15) in Salt Lake City. Team 4 was represented by Jack Slettebak and Jordi Wolfson-Pou, and Team 5 by Tom Stitt and Julian Gilyard. Software updates were installed on the cluster including the newest versions of Matlab 2015a, IDL, and Open64. For the bug name software We continue to monitor releases and test them, and release them as they are released to the public. A series of three HPCF tech. reports were released by the user support group that analyze and compare the performance of the CPUs in the three portions of maya. The reports with numbers HPCF-2015-6, HPCF-2015-7, and HPCF-2015-8, respectively, are posted on the HPCF Publications Page. The transition of all HPCF user groups to the new Lustre file system has been completed. Each PI group’s storage was individually migrated from the old system to the newer Lustre file system. The newer file system includes a larger and newer storage unit which will provide high speed storage for the hpc cluster. The cluster formerly know as tara has now been removed from service and is completely migrated into the maya cluster as the maya2009 component. All the nodes from Tara have been wiped and reinstalled with the newer Maya operating system. During this migration the firmware and bios settings have been updated to give the highest performance. These nodes have been migrated into the node section n154-n237. The formal announcement was made inviting all active HPCF users to start using the new maya cluster. For a detailed description of the cluster please see the hpcf website HPCF homepage. The 2014 participants Kendall Queen, Annie Dai, David Palensky, Alex Piatski, and Gina Vockeroth of the REU Site: Interdisciplinary Program in High Performance Computing just had their team’s work accepted as paper in UMBC Review: Journal of Undergraduate Research . It will appear in April 2015 when it is released at the Undergraduate Research and Creative Achievement Day. The 2014 REU Site: Interdisciplinary Program in High Performance Computing ends with poster presentations from each team at theSummer Undergraduate Research Fest (SURF). Among only five oral presentations, two came from this program. The conference was attended by 119 students and featured 56 posters in two sessions. For more accomplishments of the 2014 program, see the links to Projects, Detailed Schedule, Special Events, and Photo Album under its tab. UMBC hosted the Baltimore, MD session of the Intel Xeon Phi Coprocessor Developer Training Series. This all day event brought software developers from the Baltimore region to UMBC to learn the foundation needed for modernizing their code to take full advantage of Intel Xeon processors and Intel Xeon Phi coprocessors. 2013 Participant Jesse Smith of the REU Site: Interdisciplinary Program in High Performance Computing is featured in the Say Something column of the Chronicle of Higher Education . He talks about the impact of undergraduate research and the Meyerhoff Scholars Program on his future. This column is an audio series, for which he was interviewed while at an intership in Iowa. The Chronicle appears weekly in both print and online and is arguably the journal of record for Higher Education in North America. In this capacity, it reaches faculty, administrators, and staff at most institutions who will hear about UMBC in this way. The 2014 REU Site: Interdisciplinary Program in High Performance Computing kicked off at today’s welcome meeting with new records all around, from 22 research participants (selected from a new record of 170+ applicants), five graduate assistants, and four faculty mentors. The participants include eight NSA Scholars from the Meyerhoff Scholars Program, a new record number in a continued partnership with this nationally acclaimed program at UMBC. The graduate assistants are funded partially by the Vice President for Research and by the Meyerhoff Program, for which the program is very grateful. The new cluster equipment has begun to arrive from Dell. HPCF personnel will be working with DoIT to update the documentation on this web page while the equipment is set up and tested. During this time, much of the web site will be “under construction” (especially underResources for Tara Users), so please bear with us during the transition. HPCF has selected Dell as the vendor for its next-generation computing equipment, which will used to be extend the cluster tara. The new equipment includes 19 CPU/GPU compute nodes, 19 CPU/Phi nodes, and 34 CPU-only nodes, as well as high performance networking equipment. Each compute node carries two Intel Ivy Bridge processors with eight cores apiece, for a total of 16 cores per node. The GPU and Phi coprocessors present exciting new opportunities for high performance computing. Each CPU/GPU node carries two NVIDIA K20 GPUs, while each CPU/Phi node carries two Intel Phi 5110P accelerators. The web page will be updated in the coming months as the equipment makes its way to UMBC and becomes operational. HPCF RA Andrew Raim presented a workshop to the department of Math and Statistics on an R package called pbdR for high performance computing. The handout and examples codes are available as Technical Report HPCF-2013-2. pbdR (“Programming with Big Data in R”, rdav.nics.tennessee.edu/2012/09/pbdr) is a recent package for high performance computing in R offered by the Remote Data Analysis and Visualization Center (RDAV) at the National Institute for Computational Sciences (NICS). pbdR, like its predecessor Rmpi, presents the appealing possibility of high level Message Passing Interface (MPI) programming in the open source math/statistics environment R. pdbR also supports higher level functionality for distributed dense matrix operations and scalable linear algebra. We have recently installed pbdR to the cluster tara at the High Performance Computing Facility (www.umbc.edu/hpcf). In this informal tutorial, we will demonstrate running pbdR programs through the scheduler on tara and some of the basic capabilities of the software. The cluster tara has placed #15 on the (unofficial) Green Graph 500 List. This list ranks systems on the Graph 500 list by the efficiency of their energy consumption. In Summer 2012, a team of undergraduate students in the REU Site placed tara on the Graph 500 list, from which the ranking in the Green Graph 500 list is derived. A team of undergraduate students participating in the Summer 2012 HPC REU Site took on theresearch project to implement and run the Graph 500 benchmark to assess the performance of the cluster tara. This benchmark measures performance in accessing memory, as opposed to CPU performance which is emphasized in more traditional benchmarks for HPC. The submission was accepted, and tara ranked 98th on the November 2012 list. For details, see the technical report HPCF-2012-11 in our publications.The ranking was announced at the Supercomputing 2012 conference in Salt Lake City. 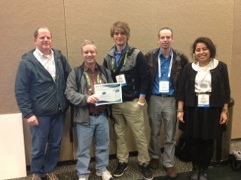 Pictured are (left to right) the client David Mountain, mentor Dr. Matthias Gobbert, and students Jordan Angel, Nathan Wardrip, and Amy Flores, holding the official certificate for the ranking. Not able to join them at the conference were client Richard Murphy and student Justine Heritage. We acknowledge funding support for the student travel from the National Security Agency and the National Science Foundation. The MRI proposal submitted in January with 30 researchers from 10 departments and research centers across the campus was successful! The National Science Foundation awarded the grant on September 04, 2012 with $300,000 from the foundation. With mandatory institutional cost-sharing of $128,571 from UMBC, this contributes a total of $428,571 towards sustaining HPCF as core facility into the future. HPCF RA Andrew Raim gave a talk at the 2012 Joint Statistical Meetings in San Diego, CA. The talk An Approximate Fisher Scoring Algorithm for Finite Mixtures of Multinomials was based on Technical Report HPCF-2012-14. We received the formal award of the three-year renewal of the REU Site: Interdisciplinary Program in High Performance Computing on June 20, 2012. This Research Experiences for Undergraduates summer program is closely associated with HPCF and uses its cluster as integral part of the program. The grant for summer programs in 2012, 2013, and 2014 extends the program to 12 funded participants and is jointly funded by the National Science Foundation (NSF) and the National Security Agency (NSA). Sai Popuri gave a talk at the UseR! 2012 conference in Nashville, TN. The talk Implementation of the binomial method of option pricing using parallel computing in R was based on a project at HPCF with Dr. Nagaraj Neerchal. The REU Site: Interdisciplinary Program in High Performance Computing that is closely associated with HPCF and uses its cluster received a request from the National Science Foundation (NSF) for a rebudget at the level of supporting 12 participants each year in 2012, 2013, and 2014. This includes additional support from the National Security Agency (NSA) that permits 50% more participants to be supported than in 2010 and 2011. The HPCF user community, with cost-sharing support from the Vice Presidents for IT and for Research, submitted a new proposal to the National Science Foundation’s MRI program. The proposal requests support for one iDataPlex rack with 42 state-of-the-art hybrid compute nodes, each with two eight-core Intel Nehalem CPUs and two NVIDIA GPUs, an extension of the InfiniBand interconnect, and additional central storage. This proposal is supported by 30 researchers from 10 departments and research centers across the campus. Dr. Nagaraj Neerchal, Director of the Center for Interdisciplinary Research and Consulting (CIRC), was selected Entrepreneurship Fellow for 2012 by the Alex. Brown Center for Entrepreneurship, along with Dr. Amy Froide (History) and Dr. George Karabatis (IS). Entrepreneurship Fellows raise the profile of entrepreneurship on campus, for which Dr. Neerchal is a clear prototype with his engagement in CIRC. Andrew Raim, Ph.D. student in Statistics, continues as HPCF RAs for 2011-12. The HPCF user support is accessed by e-mail to hpc-support@lists.umbc.edu, for convenience the same e-mail used to report system problems. You need to be in the UMBC domain to send a mail to this address. The user meeting on the new scheduling policy on June 15 was attended by 16 members of the user community. First, Dr. Gobbert explained the philosophical ideas behind the new design: Any user can submit as many jobs as desired; when another users submits a job, it should have a higher priority than the already queued jobs, assuming equal priority in other respects. This and other principals are contained in SLURM’s fair-use feature that we are using now. Then, HPCF RA Andrew Raim detailed the synta of the SLURM submission script to access the features of its fair-use feature. The Department of Mathematics and Statistics hosted the 5th Annual Probability and Statistics Day at UMBC. One of the conference attractions was the student poster presentation, where HPCF RA Andrew Raim collected third prize for his poster The approximate fisher information matrix for multinomial mixture models. This work with advisor Dr. Nagaraj Neerchal featured simulations that were run in parallel using the SNOW package for R.
A new MRI proposal was submitted to extend the 2009 MRI proposal. The new proposal features a strong participation of faculty, featuring a total of 41 researchers from 15 departments and research centers across the campus. These totals include departments new to the effort such as Information Systems and the Institute of Fluorescence. HPCF RA David Trott and Dr. Matthias Gobbert attended the Boston area COMSOL conference where they presented their conference paper Conducting finite element convergence studies using COMSOL 4.0. This is an example of the cross collaboration between CIRC and HPCF. HPCF users met for a presentation by Dr. Gobbert on the features of tara and its performance. Complete details of the performance results presented can be found in the tech. reports HPCF-2010-2 and HPCF-2010-4 on the Publications page. ENGR 104 was filled to capacity with 21 attendees. The photos show users with tara during the tour of the computer room and during the hands-on training session with HPCF RAs Andrew Raim and David Trott. Andrew Raim and David Trott, graduate students in the Statistics and Applied Mathematics programs, respectively, have been appointed as HPCF RAs for 2010-11. The HPCF RAs are available to provide user support and help with research on tara. Please send e-mail to hpc-support@lists.umbc.edu to make initial contact with them. The new cluster tara was released for public use. Students in Math 627 have already been using it for the semester. With the transfer and final synchronization of all data to the new central storage completed during the scheduled downtime on Tuesday, April 20, 2010, the cluster was ready to release. The first user meeting is scheduled for Friday, April 30, 2010. We thank the tireless work of DoIT staff in the setup of the cluster and its storage and cooling. Dr. Matthias Gobbert is the recipient of the 2010 University System of Maryland Board of Regents Faculty Award for Excellence in Mentoring, in recognition of his success in using the Center for Interdisciplinary Research and Consulting, the UMBC High Performance Computing Facility, and other initiatives in leading many graduate students to their first publications. Dr. Gobbert was honored at the UMBC Faculty and Staff Awards Ceremony on April 07, and the award was formally given as part of the Board of Regents meeting on April 16. 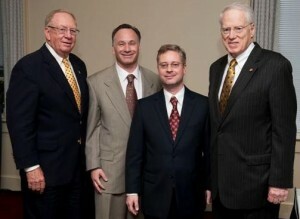 The photo shows (from left to right) Board of Regents Chair Clifford M. Kendall, UMBC Provost Elliot Hirshman, Dr. Gobbert, and University System Chancellor William Brit Kirwan at the Regents meeting. Research on hurricane modeling by Lynn Sparling (Physics) and her group is summarized in this research highlight. HPCF is starting the search for a post-doctoral research associate to extend the facility’s user support significantly through collaborative research in a consulting approach. Please help identify suitable candidates! The complete job ad is posted. HPCF releases its new webpage design at www.umbc.edu/hpcf. The new, more flexible design features was developed in collaboration with our partners in CIRC (www.umbc.edu/circ) and features more attractive visuals and a current look tied in with UMBC’s colors. This webpage is designed to document the new cluster tara, which is in testing now and will be released to the public soon. Information about the existing system hpc can be found at the hpc webpage.